I finished reading Atonement last week. It moved me to tears, which surprised me as I knew the story, having read it some years ago and I’d watched the film last weekend. I have written before that I am often disappointed seeing the film of a book and I think TJ in his comment identified my problem when he said that he likes to keep his own images of characters and settings in his head, rather than some cinematographer’s. That is just how I feel. I also don’t like it when the film moves too far away from the book. In this case the film is mostly faithful to the book, with minor alterations, except for the ending. I prefer the book’s ending. I don’t want to write too much about the plot because if you haven’t read the book or seen the film I don’t want to spoil it by giving away too much. In my view the book is superior overall to the film. It was shortlisted for the Booker Prize in 2001, which that year was won by Peter Carey’s True History of the Kelly Gang (which I couldn’t read beyond the first chapter – maybe I should have another go?). It’s a complex story, split into four parts and told from several points of view. In both the book and the film we see different versions of the same events, which adds depth and introduces uncertainty and ambiguity about what actually happened. It begins on a hot day in the summer of 1935 when Briony, then aged thirteen witnesses an event between her older sister Cecelia and her childhood friend Robbie that changed all three of their lives. It’s a captivating story of the use of imagination, shame and forgiveness, love, war and class-consciousness in England in the twentieth century. The depiction of the Second World War is both horrifying and emotional as British troops were withdrawn from France in 1940. The age of clear answers was over. So was the age of characters and plots. Despite her journal sketches, she no longer believed in characters. They were quaint devices that belonged to the nineteenth century. The very concept of character was founded on errors that modern pyschology had exposed. Plots too were like rusted machinery whose wheels would no longer turn. A modern novelist could no more write characters and plots than a modern composer would a Mozart symphony. It was though, perception, sensations that interested her, the conscious mind as a river through time, and how to represent its onward roll, as well as all the tributaries that would swell it, and the obstacles that would divert it. … To enter a mind and show it at work, or being worked on, and to do this within a symmetrical design – this would be an artistic triumph. As indicated in this quotation Briony is an admirer of Virginia Woolf and stream-of-consciousness writing, and her novel is rejected by the editor who considered it “owed a little too much to the techniques of Mrs Woolf.” Her novel draws on what she saw as a child, which she hadn’t understood. Her imagination takes over providing her with a version of events that may or may not be right. She becomes confused and as she matures begins to reflect that what she “knew” may not have been what really happened. 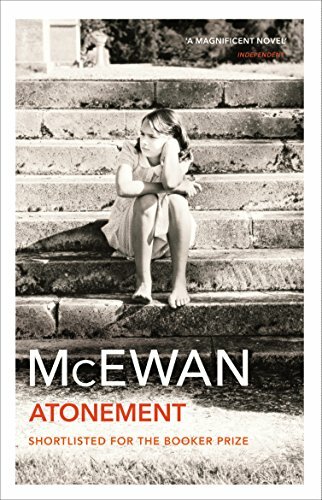 I like the way McEwan interweaves the story, with its vividly-drawn characters and harrowing descriptions of war with reflections on the process of writing and the interpretation of novels. I found it a thought-provoking book with several layers. I’ve read several of his books and I think this one, along with Enduring Love, is my favourite. Margaret—You do a great job of writing about this book and your re-reading experience, without giving too much away. And what a great quote. I can see I’ll have to take the plunge now and give up my status as the only person on earth who hasn’t read Atonement (but no movie for me). Thanks also for the link to my blog! TJ, I think that from now on I’m not going to watch any more films of books – I prefer to keep my own images. I do hope you’ll enjoy Atonement. I saw this movie about a month ago and it has haunted me. I’ve been wanting to read the book ever since. You’ve just given me no excuses to go and get the book! Thanks. I read about two pages of The True History of the Kelly Gang before I quit. My philosophy is if I can’t stand the style of writing like that, I won’t like it after 100 pages. I haven’t read Atonement. It sounds wonderful. Loved Atonement, too–now I really need to read Enduring Love! I am the other person who hasn’t read this book. One day soon hopefully. I probably will watch the movie first and then read it. That seems to work better for me sometimes. Thanks for a great review! I listened to Atonement on audio, and now I’m wondering how much I missed of the experience of actually reading it. That might be a lot of fun to do one day. I saw the movie and liked it okay, but I agree with you — the book is much better! I appreciated this book much more the second time round. I enjoy McEwan’s writing, although I know he’s not universally liked. Have you read On Chesil Beach? I listened to it on audiobook (read by the author) and quite loved it. The audiobook has a nice interview with McEwan as well. I did see the movie, and I’m in total agreement with you and TJ. I’m nearly always disappointed because the characters and scenery don’t look as I’d pictured. Surprisingly, Atonement was quite in tune with my mental images! Revecca (or is it Rebecca?) the book is even more haunting than the film. Rebecca, I usually give a book about 50 pages before I give up, but some I don’t bother with after the first page. Gentle Reader I think you’ll enjoy Enduring Love. Kay it works for me too, but I’ve usually read the book first. Dorothy I think you’d like the book. May be I’ll listen to the audiobook . Ravenous Reader, I’ve read On Chesil Beach. I thought it was good, but I’d have liked it to be longer and it was not quite as good as some of his other books. I’d like to listen to it, particularly for the interview with Ian McEwan. I saw a programme about the making of the Atonement film which included an interview with him. He was pleased that the director had stuck with the structure of the book.